Thank you for sharing your story. I am so glad to have found this post. I have hope. I feel like I am such a crybaby-I cried after the second time orienting on nights. I have been stressed and the unit that I am orienting on is overworked and understaffed. So, yeah, I don't think I got the appropriate orientation on the day shift. I just finished my first week on the nights orientation and it was terrible. They expect me to know everything and they complain about each other behind each others' backs. A few of the nurses gave encouragement and said that a lot of the nurses that ate the young were gotten rid of. Hmm. That might be encouraging. There are a few still around. 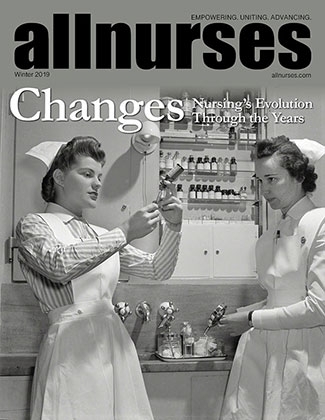 It was hard to go back and I can relate w/how even the PSAs and clerks treat new nurses. I did not even get all my passwords to all the programs so I do not have experience ordering labs and simple things on the computer. A couple of the nicer nurses came to give me encouragement-unfortunately they are all working days. They said they were in the same situation when they started out and they survived and said I can too. I hope I can survive the treatment. I am emotional and need to be more outspoken. I need to not take things personally. I chose to be a nurse and I want to be a good nurse. I also do not want to get caught up in the bickering and talking behind backs that I see. I have 3 school-aged children and a very supportive husband who works days now. He worked nights while I was in nursing school so it's my turn. He was able to handle nights, I can too. I hope. I suppose there are the same types of people in other depts and fields so I can handle it here. I finished the BS nursing and passed the NCLEX. :) Thanks for the encouragement. Took NCLEX @ 8AM.. ALL 265! Yes, finally a little after 3pm I checked the BON website & I PASSED! Whew! was worried for 4 days! Thanks!